Precinct maps in .pdf format for viewing/printing in Adobe Acrobat Reader. Shows Adjacent precincts. Call Election Division at 213-978-0444 if you would like to request CD ($20.00 per CD set) prior to pickup. 24 hour notice is required. Arcview Geographic software compatible data ("Shape" Files) of all Precinct Boundaries. Call Election Division at 213-978-0444 if you would like to request a CD ($20.00 per CD) prior to pickup. 24 hour notice is required. DISCLAIMER: The information contained in these pages was valid at the time of publication. 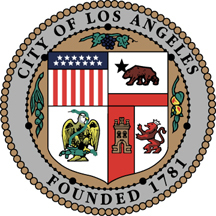 The City Clerk of the City of Los Angeles reserves the right to modify, update, change or make improvements at any time without notice and assumes no liability for damages incurred directly or indirectly as a result of errors, omissions or discrepancies.